Even the little one’s want to know how much they grew in the past month. It’s a frame of reference. However, especially in geophysics we have not agreed on the same frame of reference. When you look at your data, you better make sure if it’s meters or feet or miles. It’s quite easy to convert from feet to meter, as it is just 3feet = 1m, however when we go from miles to kilometers it gets more tricky. One mile equals 1.6 kilometers. So when we convert from one mile to kilometers, we can multiply by 8 and divide by 5. That is quite a hassle. The Fibonacci sequence is a fascinating thing. The closer you look you can find it in many areas. One, I want to show you now. The sequence is pretty simple. You start with 0 and 1 as the first two numbers. Add them together for the third number, so 1. Then you go on and just add the last two digits together and get the next number. What’s really unique between these, is the division of any two adjacent numbers. The higher you go on this sequence, the closer we come to a very special number: The golden ratio. 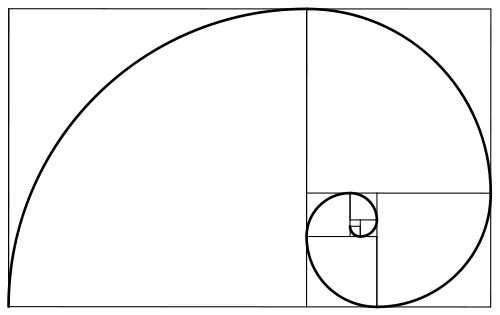 As the gif shows, the golden ratio is somewhere around 1.6. Which makes for a nice coincidence with our miles vs km problem. We can convert from miles to km just taking the next fibonacci number. Of course it also works with compund numbers. 16km is not in the sequence, but 2 times 8km will give you 2 times 5miles, although this one might have been obvious as 1 mile is still 1.6km. When you’re looking for 18miles, you can also add 13mi and 5mi, which amount to 21km plus 8km, so 29km. Is that close enough for you? For me it’s way easier than multiply8-divide5 or the other way around. If this is any help for you, let me know in the comments. Posted in Tools and tagged Fibonacci, Fibonacci spiral, kilometer, mile.